On 21th of September the allrussian campaign «Energy efficiency - the largest, cleanest and cheapest source of energy in Russia» was launched in St. Petersburg within frameworks of the days of Europe. 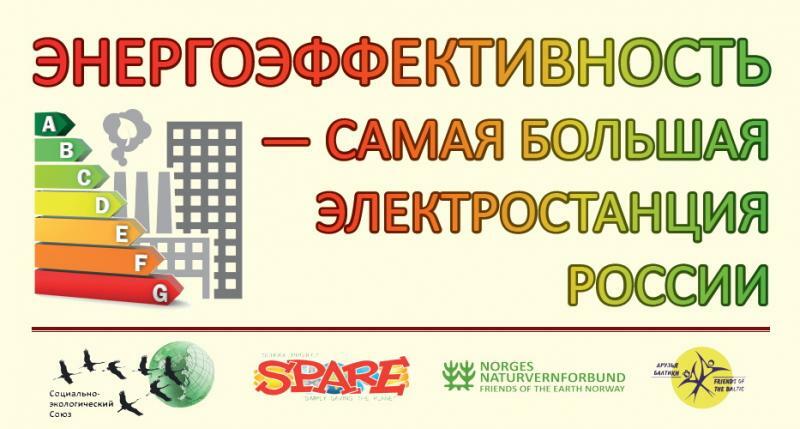 Climate Secretariat of the Russian Socio-ecological Union and Friends of the Baltic NGO - Russian SPARE-coordinator presented the exhibition «Simple lessons of energy efficiency» that showed how each of us can save energy, resources, and the family budget. The campaign was created to show that the potential resources of energy efficiency in our country allow us to free up enormous amounts of energy, and this is a real source of energy which can be used. According to the International Energy Agency, the energy received from what we call energy efficiency and energy saving, cost four times cheaper than the energy obtained from building new power stations. The energy which we get from energy efficiency, more secure for nature and people, allows to reduce polluting emissions into the atmosphere and the greenhouse gas emissions that lead to climate change. Only the modernization of lighting in Russia could give savings of 57 billion megawatts of power . Everyone can be a part of allrussian campaign «Energy efficiency - the largest, cleanest and cheapest source of energy in Russia» starting with yourself. Table exebition of «Friends of the Baltic» clearly showed people how easy it is to save energy and resources. Part of the exebition was the «energy efficient suitcase» - desktop exhibition, which shows several aspects of energy saving: saving of heat, water and electricity. In the suitcase you can see different types of lamps, motion sensor that turns off the lights when the room is unoccupied, thereby saving electricity. The audience was very interested in thermal insulation of wooden windows and examples of materials that can be used, as many already know minuses of euro windows, the need for additional ventilation and harmful substances, in particular chlorine contained in them. Visitors learned about light and dark wallpapers that they play a large role in the efficiency of lighting. Dark wallpapers require more light, because absorb it. I.e. for energy saving in the apartment it is enough to use light wallpaper. The next step in energy saving - conserving lighting. Energy saving lamp consumes 4.5 times less energy for the same light intensity than incandescent bulbs and led nearly 20 times more economical than incandescent bulbs. And life service of these lamps is in the hundreds of times longer. The next step is to use a special device to help save energy. Motion sensor, dimmer, as well as the device, on which you can set the time after which electronics could be turn off without your help. Most of the audience for the first time saw controllers of heat to the radiator, which allow to reduce the temperature of central heating, and not open the windows, causing the battery to heat the street. Children and teachers, which came to the exhibition, learn about SPARE project, and were invited to participate in the competition of school projects «Energy and environment». Teachers were able to connect to the project Step to ecosupport»,which provides trainings and consulting of ecosupporters for schools. Ecossuporters will help schools to find reserves for energy saving and resources, and other eco-friendly solutions.